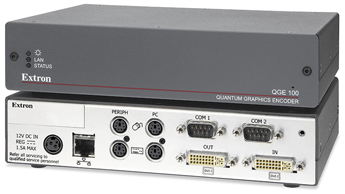 The Extron QGE 100 Quantum Graphics Encoder is used to stream RGB or DVI screen captures from PCs or other graphic sources to Quantum® Elite videowall processors. 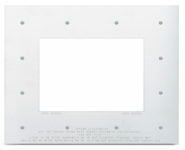 It provides high scalability, allowing hundreds of sources such as maps, data screens, and other low-motion graphic input signals to be interfaced to Quantum Elite over an IP network. The QGE 100 applies high performance, lossless compression with 4:4:4, 24-bit color source reproduction while using low bandwidth streaming into a Quantum Elite processor or QGE 100 Viewer software.